On my way to IKEA today (Friday is Ikea day) I saw a 4 car pile up on a bridge on the 4th ring road. I don't know what exactly happened but it involved a Corvette, a Toyota Prado, a Lexus GS 300 and a 4th car I didn't really see well. The Prado had the most damage, it looked as if it had flipped. The corvette was the second badly damaged car, it was totaled from the front. It was facing the right hand barrier when I saw it so it could have rammed into the barrier. It was also the first car in the accident. The prado was the second, Lexus third and the unknown car the 4th. The Lexus was badly damaged from the rear but only on the right side. Using my CSI and CSI: Miami experience, my guess would be the Corvette was speeding, hit the Prado from the rear on the left side, lost control and spun and hit the right barrier. The Prado hit the Lexus on the back right side so that might mean the Prado driver also lost control or panicked, swerved right, hit the lexus, then also spun, lost its balanced and flipped. The Lexus then might have hit the 4th car from the rear. Here is a picture of the corvette. I am probably way off..
is that guy behind the police man looking at ya? i agree with u about the corvette, it must be the one that screwed up first. 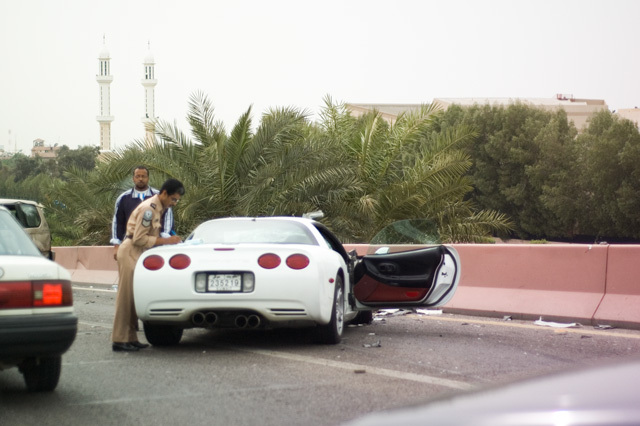 goodness me, drivers in kuwait have to arrange some insurance for their lives against unqaulified driving-licsence holders! I was at Ikea last evening too, did not know it would be too crowded, but checked things around. 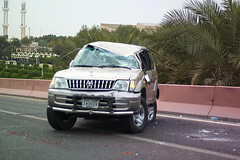 The traffic accidents are just getting worse and worse eveything thinks that would never happen to me I know how to drive! Its scary!